It wouldn’t be Thanksgiving without the leftovers. I’m not a huge fan of leftovers, but holiday leftovers are something I actually look forward to. Some things taste better the next day, like dressing; others, such as sweet potato casserole and macaroni and cheese, are just as good reheated as they were the day before. And nothing beats a Thanksgiving turkey sandwich with mayonnaise and cranberry sauce. Yum. It’s a tradition around these parts. But sometimes, you just can’t handle another sandwich. What are you supposed to do with all that leftover meat? I find that leftover turkey, especially the dark meat and those tiny bits that you picked off the carcass and don’t want to waste, does very well in casseroles. You can use it as a substitute for chicken in any chicken casserole, or you can do like my mom did, and create your own recipe. This is our favorite turkey leftover solution. Preheat oven to 350°. Grease a 13×9 baking dish with cooking spray. Thaw broccoli and cut up any large pieces. In a small bowl, combine soup, mayonnaise, lemon juice, and seasonings. Stir well. In a large bowl combine turkey and broccoli. Add in soup mixture and mix together. Spread evenly in prepared dish. 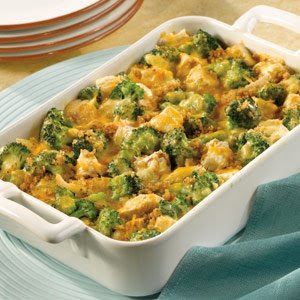 Combine breadcrumbs and butter and sprinkle over the top of the casserole. Bake for 20-25 minutes. Remove from oven, top evenly with cheese. Return the pan to the oven and bake 5 minutes longer, or until the cheese is melted. Previous post: 12 Days of Christmas Cookies!